I want to make a proposal for a new Stove-Testing-Concept. I also enclose you a sample an excel sheet: BCSt_BPFactor_Chart02.xls the boiling time factor will be in this case of this institutional stove "163"
which is the surface of the curve above the red line on the graph. In a word: You use the size of surface (=mm x mm or mm2, it gives a number) of the temperature curve as an indicator for the quality of the stove! 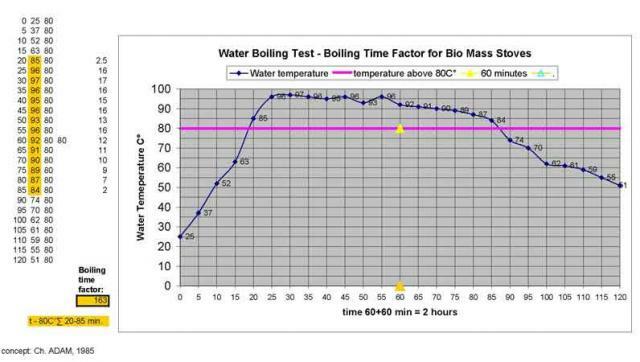 This number I call " BTF= boiling time factor "
I can draft a curve of the water temperature over time. And i take into account the surface of the temperature curve above 80°C. This is normally the temperature which is helpful for the cooking process. The temperature is taken and noted every 5 Minutes. The test goes over 2 hours. All the fuel is used during the first hour. That means after the second hour all the fuel is burned. No need to search for left-over pieces charcoal. stopping the fire, weighting the charcoal, restarting the fire (continuing) the fire from new. Especially for larger community stoves with bigger fire- I really found this method improper. * The BTF procedure takes into account if the stove is a low-mass or a high mass stove. * It takes into account if the stoves keeps the heat after the fuel is burned. (Also the chimney quality/damper effectiveness). This is because no fuel is added after one hour. A quick drop of temperature (smaller surface on the monitoring paper, steeper dropping angle) indicates a not-so-good stove. * If the temperature is kept for a while (larger surface and slower angle on the monitoring paper) this gives an indication for a good stove. 1) The stove testing times goes over 2 phases: One hour of heating, one hour when no fuel added. 2) You start to make a quick fire and reach the boiling point quickly. Afterwards the fuel is evenly distributed for the remaining hour. 4) The fuel is taken by volume (e.g. an empty can of about 1(?) liter,~0,5kg(? ), (or 8 (?) liter, ~4kg(?) for community stoves) filled with fuel) but the weight is exactly noted. However the objective of the BTF is not to evaporate water- but to heat up water quickly and to keep it up hot over an extended period in relation to little fuel used. A fixed amount of water and fixed amount of fuel is used for all the different test. There is no need to use integral calculations for finding the "surface above 80°C", simple use this formula: add up all "water temperature minus-80°C" every 5 minutes. This number can give a universal classification for the quality of a stove in relation to other stoves. (For instance also categories could be made, like we have them shown on labels on all new fridges which are sold in Europe. A= for best energy efficiency, B= for acceptable energy efficiency, C= for low energy efficiency). learn how heat transfer and combustion efficiency can be improved. a stove to be effective, perhaps more than wanting it to be "efficient". dependable way to develop appropriate technology. 'anthropological' survey of the stove in the environment. these tests have been the international standard.